I love it when a group of young individuals come together to showcase their talents, whatever it may be. 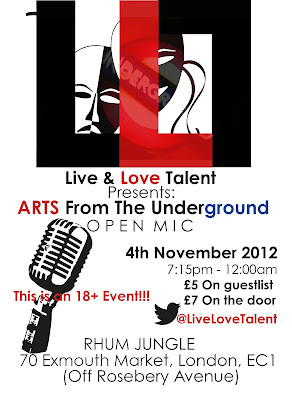 Live & Love Talent presents 'Arts From The Underground Open Mic', an event that occurs every other month in London, where artists - both, upcoming and established can showcase their talent and what they're about. The Open Mic event in the month of November is expected to be bigger and better than the last one in September. From singers to dancers, fashion designers to comedians, rappers, actors and even young entrepreneurs to talk about their businesses, the event is also a great networking event for Young people. To end the Halloween week - Live & Love Talents' next show, November 4th will be a Halloween Themed event, where people can wear their fancy dress - or however they feel comfortable. A prize will even be up for grabs for the best dressed as well! Ooh la la.